Knowing when and where to use the bathroom is one of the most important lessons that your puppy will need to know. A well-trained puppy will help to keep your home from selling like pet waste and it will make you feel good about your pet. The following information will explain the best process that how to potty train a puppy. Do not start potty training your puppy until it turns 3 months. This is very important from a physiological standpoint. When a dog is first born, it has no control over its bowel functions. ​Usually, a young pup under three months will not be able to hold its urine or waste. However, as a dog starts to develop near their third month of life; they will then be able to start to control when and where to use the bathroom. This is important for a pet owner to know because this knowledge will keep a pet owner from becoming frustrated or upset about a young pup using the bathroom everywhere. When a dog is under 3 months in age, it is best to keep the pup’s movements restricted to a specific area and to let them use the bathroom within this field. Organizations such as the Humane Society encourage pet owners to take this course of action. By the way, once a pup reaches 3 months or starts to near the age of 3 months a pet owner can start to separate them from their mother and the rest of the litter for potty training. People who have a house full of pups can also start to train the whole litter as the near their 3rd month of life. Usually, puppies can learn how to use the bathroom together. Patience: This attribute is necessary for the potty training process. A pup that is being trained to use the bathroom will not do everything in the right way. In short, they will have accidents and make messes. So, having patience, as they say is truly a virtue in this type of situation. Consistence: A person must also be consistent when potty training a dog. Consistency is important because it provides a routine way for a dog to learn how to use the bathroom and when they should be going. Doing the same thing over and over again is important for the potty training process. Persistence: The word persistence is close to consistence except it focus more on being determined to do something. When most people potty train their pet, they must be determined to see the process through. If not, they will usually give up and allow their pet to use the bathroom wherever they please. Forgiving: Forgiving your dog when it messes up during the potty training process is also important because it will keep you from being frustrated and angry at them when they do. You should also have a sense of humor during the potty training process since it to will help you not to take things too seriously. These skills are essential for people to have when they decide to potty train their pooch. ​How to ​Train a ​Dog ​For ​Toilet? The best way to train your pup is by getting it on a feeding schedule. Once you start to develop a regular feeding schedule, you can be able to create a consistent bathroom schedule. When your puppy is about 3 months, make it a point to feed them at least twice a day. According to the Association of Professional Dog Trainers, a pup will usually have to go to the bathroom up to an hour after they eat. For example, if you feed your dog at 7 a.m. you should get them out of the house to use the bathroom no later than 8 a.m.
Like people, all dogs are not the same when it comes to eliminating waste. Some will go earlier or later than others. The main thing to remember is that you will need to take your dog outside shortly after it eats. Over a time period of doing this, you will start to notice when your pet needs to go. You can also keep a journal to help you get an accurate idea about their bathroom times as well. When you are potty training your dog, have a regular spot for them to go to the bathroom. This spot should be a place located outside. However, you can also train your dog to use the bathroom within a specific area of your home. Keep in mind that when you train your dog to use paper, chances are they will always associate paper as the place to use the bathroom. So, if you have a lot of newspaper lying around; don’t get upset if your dog decides to use this medium to relieve itself. You should also keep your dog’s bathroom area confined. This will keep the pup from using the whole backyard as it toilet area. It will also help to keep you from having to clean up waste material from the whole backyard. Once again consistency is key to helping a pup to learn how to use the bathroom. Rewards and praises are critical to the potty training process of a pup. When a pup uses the bathroom in a place where they need to go; you must reward them with a doggy treat or some type of positive praise. (the so and so) says that this type of action is necessary for associating potty training with good behavior. 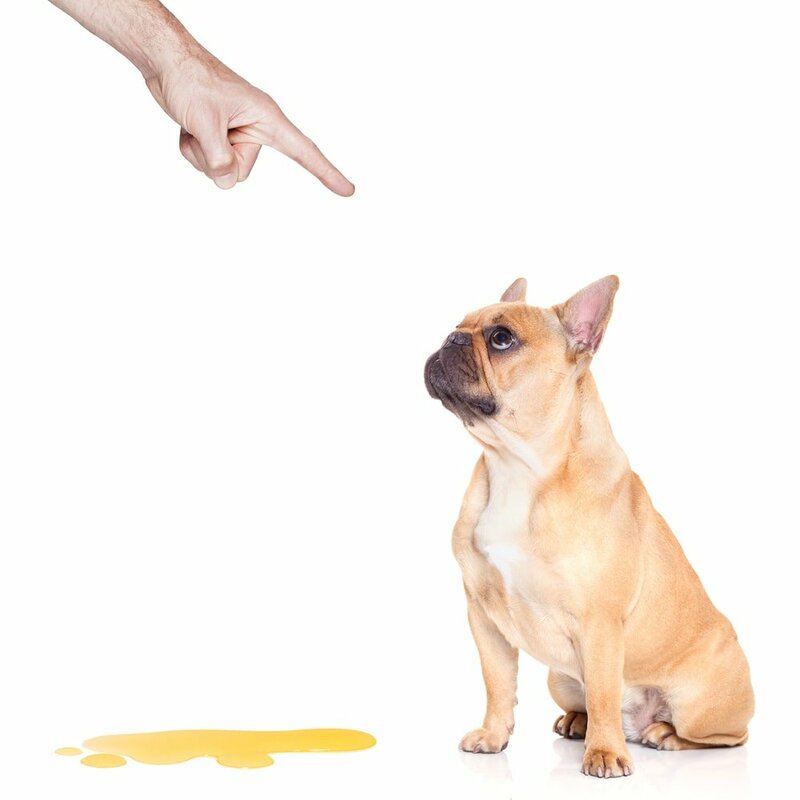 Once a pup starts to associate proper potty training techniques with good behavior they will then start to behave positively (as in properly use the bathroom); so, they can get a reward or praise from their owner. If you do these things, it will make them fearful of you and they usually won’t learn how to use the bathroom properly. Just clean up their mess, continue to be patient and keep on enforcing the good behavior. You can confine your dog if you have to. Just make sure that the space that you are putting them into gives them enough room to turn around and to use the bathroom. Most dogs will not go in an area where there is little room to move. Often times, they will wait until you release them from their confinement to use the bathroom. So, having the extra space is necessary for the puppy who must be confined to limited space. If a confined dog uses the bathroom, they will usually do so on one side of the caged area. So, make sure that there is enough space for your dog to use the bathroom and to move around during their confinement. This is important because it will allow you to leave your pet safely alone when you have to go away. It will also help you to teach your pet how to use the bathroom while they are in confinement. The potty training process for a dog will usually last between 3 to 6 months. This is why having patience and persistence is very important. Keep in mind that some people claim that you can do it in 3 days. That might be true. The point is that every dog is not the same and some will catch on faster than others. The main thing to remember is that you must be patient, consistent, persistent and forgiving. These qualities will go a long way with helping you to teach your dog how to use the bathroom properly. One last thing you should not forget is that your dog should eventually catch on to the toilet training process. Once they do, all the hard work and effort will pay off with a well-trained dog that knows how to use the bathroom properly.